I just don't trust fix-a-flat kits. Anybody ever buy or currently have a spare/donut tire in your trunk of your RX8? What brand/size? Any ideas on where to get one cheap? Junkyards, etc? Let me know. My 8 came with a donut... Do some trims not?? The spare tire kit was an option. They occasionally pop up here and there in the FS section. I have it, but am about to go to bed and don't care for going into the garage to check out the tire specs. That's just the mounting kit, without the tire itself. Does not look like much of a bargain. A lot of us who do not have spares get a plug kit as a first line of defense...it will get you home if it's just a nail puncture. I don't think anyone likes the areosol glop. For starters, if you use it the tire is ruined, even if all you had was a repairable puncture. Likely to ruin the pressure sensor, too. ^ I was just showing the op an example. I basically just wanted a picture to show him that there is a kit available and how it mounts. If you buy a used kit make sure it comes with the mounting brackets. BOTH TYPES of mounting brackets; a total of four (two pairs), as you need all of them. hey, i got a spare tire for a mazda rx8. 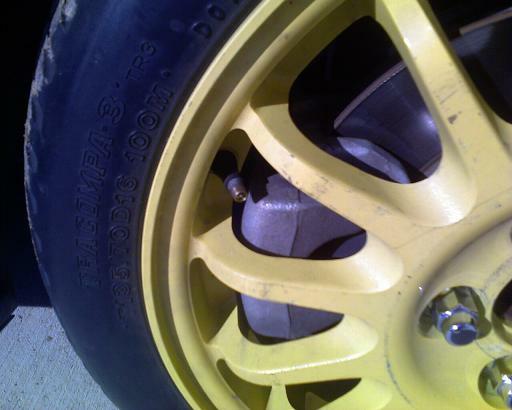 i bought the car with the spare tire (separately), it has never been used, its a yellow rim. it comes with a wheel cover and a bar that attaches in the trunk and the tire attaches to the bar. I will sell it to you if you like. let me know and il send you some pics. That's the complete kit, the last time I checked with the dealer the whole kit will cost close to $400. Do you guys really want to pay that much? The wheels are made by ENKEI, but any 17 inch spare from Toyota or Nissan will clear the brake calipers. Check this posting: LEXUS SC430 Spare. I just plan on buying a cheap 18" rim from somewhere like discount tire and then buying a cheap tire. Keep that in the trunk and problem solved. It would look a little funny having a mismatched rim but at least it wont be a donut and will get me to the shop to fix the original tire. It's amazing to me that a spare tire is an option for this car. I could probably buy almost any $3,000 car on craigslist and it would have one in the trunk, yet mazda decided to charge more for it. i don't have a spare , but the spec's are 17/175/70 , its a very skinny 17"
it will be interesting to see if an 18" fits in the RX8 trunk , any one try ? I think I bought mine for $100 shipped. donno you can get cheaper than that. I have a fifth spare Gram Light 57F and it barely fit in the trunk. Consider another 30-or-so lbs of weight to lug around in your trunk. Last edited by Grace_Excel; 04-27-2011 at 12:17 AM. It was left off because it's added weight. Mazda just gave you the choice of paying less for leaving out the spare if you think about it. Really? I can barely fit my snowboard in that little space. ...I dont see why an 18 would not fit in the trunk. You may have to put it in there thru the backseat but it should be able to go right? A full size tire and wheel fits in the trunk. Does not leave a whole lot of room, but it fits and it's not a Chinese nail puzzle to get in and out. I've got a spare wheel and tire. (Not planned - just the result of replacing a bent rim, then getting the old one straightened.) I keep it in the garage as a backup in case of a local flat. I had no problem getting it home, loading and unloading it through the normal trunk opening. I do not carry the spare with me - I'd rather have the trunk space. I've got a plug kit and belong to AAA. Last edited by ken-x8; 04-27-2011 at 07:20 AM. You have a 12VDC compressor and 'goop' kit in lieu of a spare. The spare takes up a lot of space, and adds some weight. I did get one pre-owned, but found I almost never carried it. I have one and don't even use it cause it takes up too much space and I need all my trunk space. I have the original one that come with my car. The problem is the way the RX8's differential is designed you are not supposed to put a skinny spare tire on the rear wheels or it could damage it. So if you did get a flat on a rear tire you would need to swap a tire from the front of the car onto the back and then put your space saver spare up front. A lot of work to do on the side of the road. Unless you wanted to fill up your entire trunk with a full size spare tire. I would recommend to just get a good insurance company. I think mine allows two free road side assistance calls every 6 months or something. Last edited by Jacob6875; 04-27-2011 at 01:40 PM.